When it comes to security systems, most of you know the basics. Door and window contacts, motion detectors, and fire protection make up most home security systems. 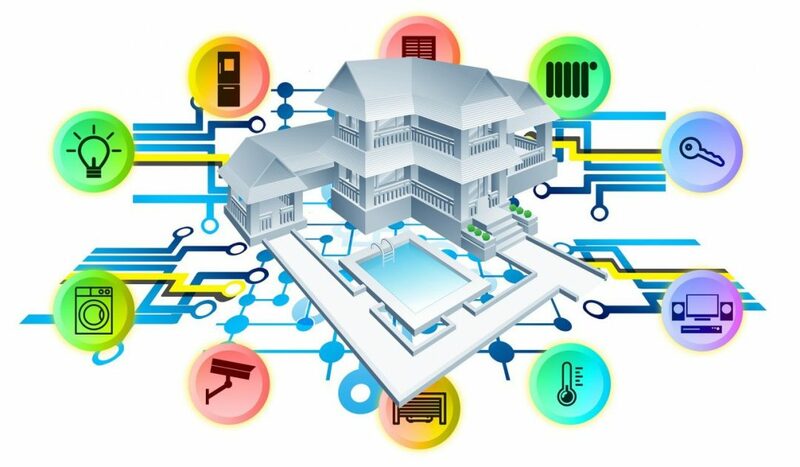 However, security systems have come a long way during this age of home automation. Security systems do a better job than ever protecting your home. What’s more, they allow you to control your devices and appliances while you’re away. Many homeowners have begun using their security system to turn their secure home into a smart home. Here’s a look at some security and home automation-related devices that you may have never thought about adding to your security system. Cell dialers have been around for decades, but the technology has advanced greatly in recent years. A cell dialer in an alarm panel can monitor a system without the use of a phone line. However, the initial cost of the early cellular devices was often as much as the cost of a phone line. Instead of buying these devices to replace phone lines, most customers used them as a backup in case a burglar cut a phone line or in case of phone line failure. Modern cell dialers can actually save money over a traditional phone service, making it a popular option for modern home and business owners alike. Many dialers — including our own powered by Alarm.com — can provide you with remote control of your security system through a smartphone or computer. Additionally, our dialer can act as a smart home hub. This allows you to control home devices and receive related updates automatically. Smart appliances are at the heart of any smart home. Adding the ability to control your alarm system remotely provides peace of mind through constant control of your security system. Expanding these features to allow for appliance control can add extra peace of mind. You can turn just about any household appliance into a smart appliance by plugging it into a smart plug. Now you can check to see if you armed your security system, then make sure you turned off your television and coffee pot. You can even turn a light on to greet you when you return home from work. Smart appliances do not begin and end with plug-in devices either. A smart garage door opener allows you to remotely open and close your garage door (or check on your garage door to see if you left it open when you left). Like many smart home features described here, you can create connections between your security system and your smart appliances. For example, you can have your lights turn on when you disarm the security system with your phone, or have your security system disarm when you open your garage door. We’ve all seen UFO-shaped cameras hanging on the ceiling at stores and businesses. But in recent years, many homeowners have installed discreet cameras to monitor their property. Adding cameras to your security system offers multiple benefits. For starters, your cameras allow you to look into your home whenever you wish. Simply pick up your smart phone and view your camera’s live stream to check on your kids or pets. If your camera senses motion, it will immediately send the footage to your phone. In addition to live streaming, your camera saves cloud-based clips for later reference. If you need to share a clip of something that happened inside or outside your home, you can do so with the click of a button. Contact sensors use the same door and window contacts that you’d use to protect the perimeter of your home. However, unlike door and window sensors, contact sensors send you an alert without sounding your alarm. 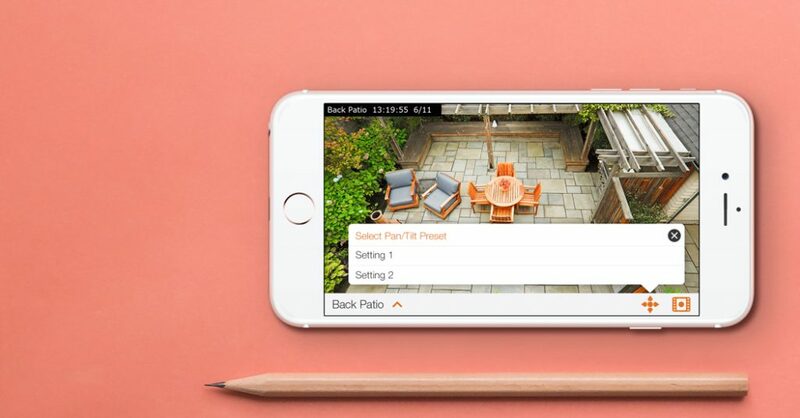 This unique smart home feature can create both life safety and property security. Consider contact sensors on pool gates, closet doors, or other sensitive areas in and around the house. You do not have to feel confined to putting these sensor on door or windows either. 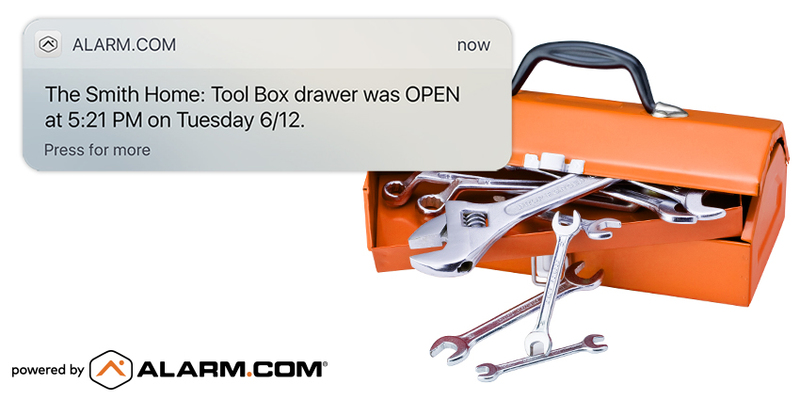 Toolboxes, safes, and equipment chests are all ideal targets for contact sensors. Because contact sensors do not cause your siren to sound or create a police response, they can remain on even when your system itself is disarmed. If you open your own pool gate door or the closet with your most expensive jewelry, you can ignore the phone alert. However, if you receive an unexpected alert from an area with a contact sensor, you may want to investigate. Putting smart locks on doors gives homeowners many advantages over standard mechanical locks. For starters, you can unlock your door remotely. If you have a contractor or pet sitter coming to the house, a smart lock allows you to let them in without giving away a key (or a code if you’ve installed a keypad lock). In addition, you can track the use of smart locks. Giving different codes to different users will allow you to see who unlocks a door, and when. Smart locks can work with other aspects of your smart home as well. For example, you can set your lock up to arm your security system when you leave and lock the door. Likewise, you can have your security system disarm when you unlock the door using your phone. These options add a great deal of extra security and convenience to your day-to-day home life. Video doorbells have many of the same benefits as a regular camera, while also protecting the most important area of the household. These unique doorbells use your doorbell wire for power, creating an easy installation. They also have a functioning doorbell, which sends an image to your phone when the doorbell rings. 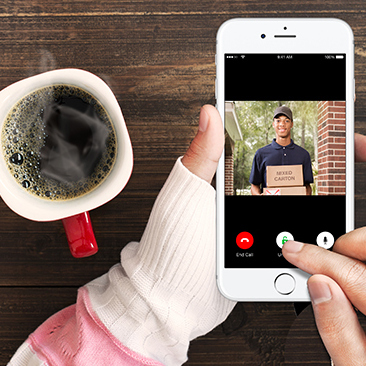 The most advanced video doorbells can even work as cameras independent from the doorbell function. In other words, the doorbell camera would record a person walking up to your door to steal a package, even without the doorbell ringing. Installing both a video doorbell and a smart lock allows you to see who is at the door, then unlock it to allow entry without even getting up. Many smart home concepts make your life more convenient. Furthermore, some of them help you save money and better manage energy. You can control the temperature at your home while away, then raise it right before you get back home. This saves money on your heating bill without taking away any comfort. Taking this concept one step further, you can set schedules for your home’s temperature based on the schedule of the people living in the house. For example, you can keep the heat low during your work week, and allow it to stay warm for your nights and weekends. Smart thermostats can do more than just control the temperature in your home. By shutting down your HVAC system when your security system’s smoke and CO detectors go into alarm, smart thermostats can also minimize the circulation of dangerous gas and carbon monoxide in your home. Smart home environment control does not end at the smart thermostat. Consider installing sensors to alert you to extreme conditions that could cause damage. Freeze and flood sensors have helped countless homeowners catch dangerous conditions before they create any major damage. These features greatly add to your home safety and security. Furthermore, they add peace of mind– if you are on vacation and have not received notification that something is wrong in your home, then all is well. Homeowners install smart home components based on what is important to them. For example, parents of small children may start with contact sensors for pool and household safety. Owners of vacation homes often focus on installing smart thermostats or smart locks to keep utility costs low and allow access to their vacation home from several states away. Many people enjoy the benefits of added video monitoring. These homeowners are most likely to lean towards installing smart cameras and doorbells. Determining what is most important to you from a security and convenience standpoint will go a long way towards helping you begin to create your own smart home. 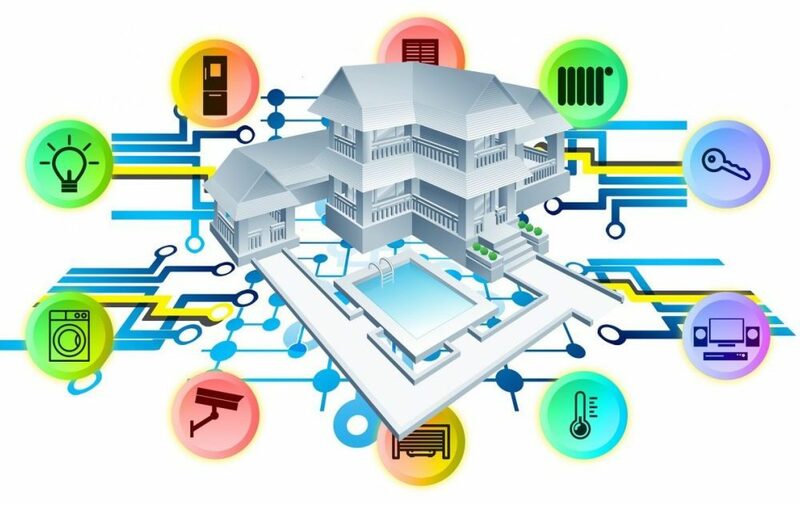 If you have any questions about smart home equipment or security systems in general, contact us to discuss your security and home automation needs. Our design experts will work with you to create a security system that makes your home more efficient, safe, and smart.